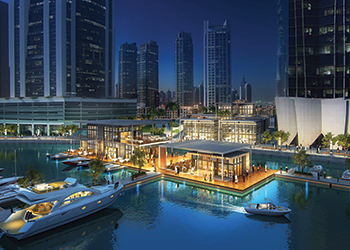 Marasi Business Bay ... a purpose-built yachting destination with floating restaurants. Finnish-owned Admares has been awarded the first phase of Marasi Business Bay, a new waterfront destination featuring the UAE’s first purpose-built yachting destination with floating restaurants and a range of leisure and entertainment facilities, in Dubai. 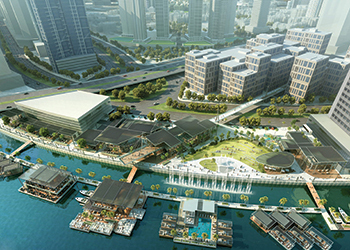 Being developed by Dubai Properties, a leading real estate group, the project will boast of the country’s longest waterfront promenade and also the UAE’s first-ever homes on water with pedestrian and boat access, besides leisure facilities and five palm tree-lined yacht marinas with approximately 700 berths, alongside floating retail and food and beverages (F&B) outlets, an assortment of onshore boutique shopping and entertainment facilities. Admares said its scope of work will include 10 water homes, two restaurants and an exclusive yacht club, all of which are state-of-the-art floating buildings. These unique architectural structures will be designed, managed and manufactured in Finland by Admares, ensuring impeccable quality that can be achieved when construction takes place in a purpose-built production facility with a workforce that specialises in construction of floating real estate, it states. The unique floating architectural structure will be manufactured in Finland and floated to Dubai, and is set to become a major future landmark for the already iconic cityscape of Dubai, it adds. Water homes at Marasi Business Bay. The development’s main architectural feature will be the homes on water designed and manufactured by Admares in Finland. A forward-thinking innovation in residential development, each home will enjoy exclusive boat access and unrivalled views of the surrounding Dubai Water Canal. “Our objective is to create unique, innovative and eco-friendly real estate products, utilising ground breaking, multi-disciplinary off-site construction technology,” remarks Hedberg. Admares, he states, is a pioneer of innovative floating construction, including the successful the Burj Al Arab Terrace, making it possible to build over water in locations where there is short supply of land. The company’s design-build floating buildings combine cutting-edge marine and construction technology providing unique real estate opportunities, he adds. Admares has started the production of the floating buildings last October with all of the manufacturing and outfitting being completed in Finland, before transportation by sea to Dubai in Q3 2017.